Coatings are used for a wide range of applications, from anti-fogging coatings for glass through to corrosion control in the aerospace and automotive industries. Nanocoatings and ultra-thin films provides an up-to-date review of the fundamentals, processes of deposition, characterisation and applications of nanocoatings. Part one covers technologies used in the creation and analysis of thin films, including chapters on current and advanced coating technologies in industry, nanostructured thin films from amphiphilic molecules, chemical and physical vapour deposition methods and methods for analysing nanocoatings and ultra-thin films. 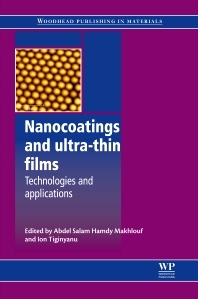 Part two focuses on the applications of nanocoatings and ultra-thin films, with chapters covering topics such as nanocoatings for architectural glass, packaging applications, conventional and smart nanocoatings for corrosion protection in aerospace engineering and ultra-thin membranes for sensor applications. With its distinguished editors and international team of contributors, Nanocoatings and ultra-thin films is an essential reference for professional engineers in the glazing, consctruction, electronics and transport industries, as well as all those with an academic research interest in the field. Professional engineers in the glazing, construction, electronics and transport industries, as well as all those with an academic research interest in the field. Abdel Salam Hamdy Makhlouf is a Full Professor (Tenured) at the College of Engineering and Computer Science, University of Texas Pan-American, USA. Professor Makhlouf has received several prestigious international awards for his research work and is an expert evaluator for the EU FP7 programme and various scholarship programmes around the world. He is an Editor for the Nanotechnology section of Insciences Journal and for the International Journal of Applied Sciences. He is also an Advisory Editor for books published by Elsevier in the area of advanced coatings and thin films. Ion Tiginyanu is Professor of Electronic Engineering at the Academy of Sciences of Moldova.